Can't find what your looking for? Contact us and we'll direct you. You may also see work sorted by our areas of expertise. Learn how a dental practice can use video. Attract new patients by giving them a chance to see you and your practice in action. Answer new patient’s questions. Address existing patients’ concerns. Check out this useful addition to our Video FAQ Series. This Conference Invitation Video was created for NAFSA, Association of International Educators. Get people excited about attending your next conference or event. Check out our Case Study. A recruiting video shows your candidates who you are, what you believe, and why they should choose to seek employment with you. Personalizing your brand and helping candidates connect your culture with your company is our priority. Take a look. A brand video is the perfect way to show your prospects who you are, what you do, and why they should choose to do business with you. A brand video shows your prospects who you are, what you do, and why they should choose to do business with you. Personalizing your brand and helping your ideal client connect you with your legal practice or firm is our priority. View this case study. Always is a branded short film created for American Homestay Network. Learn how you can enrich your brand narrative using branded short films. Take a look at our case study. Recruiting videos help your target audience learn about your organization, your culture, and your mission. People want to know what you’re doing to achieve your goals, who you strive to help, and they want to feel the impact of your work. This Social Media Teaser was released to preview NAFSA’s Up Close series which was created during NAFSA 2016 in Denver. Learn how you can maximize visibility of your Conference, Convention or Live Event. Take a look at our case study. This Social Media Video Marketing piece was created for NAFSA 2017 in support of international education’s ongoing #YouAreWelcomeHere campaign. Learn how Social Media Videos can keep your audience engaged and energized. Check out our case study now. This plenary speaker interview series is entitled, Up Close. It was created during NAFSA 2016 in Denver. Learn how you can maximize visibility of your Conference, Convention or Live Event. Take a look at our case study. This plenary speaker coverage video was created for NAFSA 2016 in Denver and features Bryan Stevenson, Founder and Executive Director of the Equal Justice Initiative. Learn how you can maximize the marketing of your Conference, Convention or Live Event. 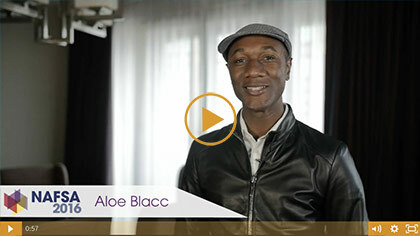 This Opening Celebration Video was created for NAFSA 2016 in Denver and features Aloe Blacc. Learn how you can maximize the marketing of your Conference, Convention or Live Event. Take a look at our case study. This Conference Highlights Video was filmed in Los Angeles and created for NAFSA, Association of International Educators. Learn how video can help you take advantage of your next event. Meet a need. Achieve a specific goal. View our Case Study now. 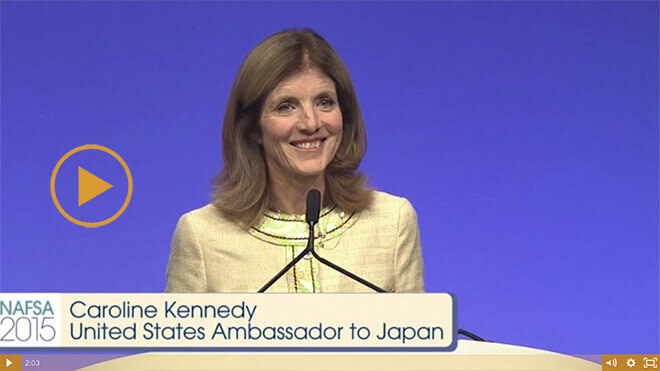 NAFSA asked us to produce this award presentation video to insure that members were kept up to date as events unfolded throughout their international conference. Check out our case study and learn how event based marketing videos can engage your target audience. 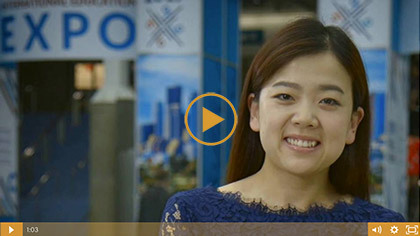 This Membership Testimonial Video created for NAFSA, Association of International Educators, is the pivotal piece of the organization’s ongoing membership campaign. Check out our Case Study. This Non-profit Advocacy Campaign Video was created in 2015 for NAFSA‘s public policy wing, Connecting Our World, and the campaign is still active today. 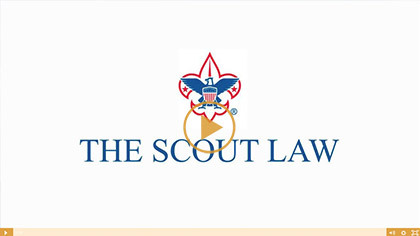 The Video Business Card is an ideal way for attorneys and partners in any practice to market themselves. Learn how video gives your prospects a chance to get to know, like and trust you. Take a look at our case study. The Video Business Card is a perfect way for Financial Services professionals and owners to market themselves. Take a look at our case study. The Video Business Card is a 60 to 90 second video of you on-camera introducing yourself, talking about your company, and giving clients a chance to see why they should be doing business with you. This recruiting video was made for South Shore Synergy, a Networking Collaborative of Diverse Business Owners and Professionals. This “Creatives & Advocates for Business” video was produced to increase website visibility and drive membership growth. Your new Brand Video shows who you are, what you do, and why your prospects should choose to do business with you. Learn about Video SEO rules and tools. What is Video SEO? VSEO is a separate search engine optimization especially for video. Learn how to use a Video FAQ Series to increase visibility, educate your prospects, and build trust in your company or organization. Understanding why is a smart place to start. There are over 40 different types of business videos. We help you choose the right video for your business. What is a Video FAQ Series? Learn how Video FAQ’s can answer your client and prospects’ top questions. See our answer to your cost question here. Boston’s first Video FAQ Series answers this and many more of your questions. National Video Production Services Available? Learn how we are able to provide National video production services to our clients. A conference welcome video is the perfect way to kick off your multi-day event. Letting your audience know what networking opportunities they can expect to enjoy, which seminars and sessions they can attend, and which speakers they can see, all helps generate excitement for your attendees. Come see our case study. Internal videos are a powerful tool for reducing or eliminating labor costs associated with employee orientation, workplace safety or new skill training. These are just a few of many ways video can save you money. See how video can improve operations and your bottom line. This 70th Anniversary celebration video was written and filmed for NAFSA. Celebrate your corporate milestones! Take a look at our Case Study.